The job market is pretty tough right now. If you are looking for a job, you will need to exercise some ingenuity and set yourself apart from the other job seekers. One of the ways you make a direct and personal impression on someone is by attending a career event. It is possible attend career/networking events at universities, the local Chamber of Commerce and at your local Department of Workforce Services (or similar government supported career services agency). Sometimes, a company will hold its own career event when it plans to make several hires. 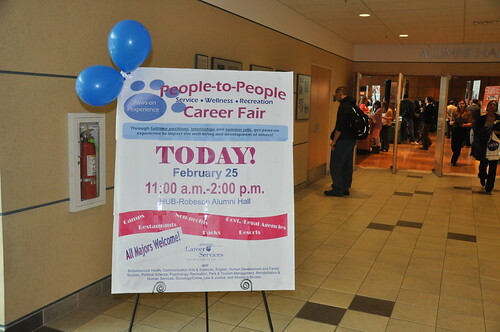 The first thing to do is find out who’s coming to the career fair looking for potential employees. Most of the time, it is possible to obtain a list before the event. Look over the list, considering which companies might be the best fit for you. You can even dig a little deeper to see if you can find information on what job openings the company wants to fill. At some career events, companies prefer it if you make an appointment to speak with a representative. Find out from the event organizer — or even from the attending company — whether or not appointment slots are available. Then, arrange to meet the recruiter at the event. If you are making a few appointments, make sure you leave adequate time between your interviews so that you aren’t late to a meeting. Since you know which companies you will be pitching while you’re there, you can prepare to sell yourself. Consider preparing a personal statement — also known as an elevator pitch. This short introduction should be a way to express your fitness for working at the company. Have an idea of slightly different things to emphasize with different reps. Don’t be too complicated, though: You can’t read your personal statement, so keep it as simple as possible. Make sure your resume is up to date. Consider preparing a cover letter to accompany the resume. If you know which companies you are targeting specifically, you can prepared different versions of your resume (and cover letter) to emphasize different skills. Be sure to label them clearly, or use sticky notes attached to the front, so that you don’t mix up your resumes. Show that you are interested in working for a company by asking open-ended questions at the career fair. Recruiters will feel better about your conversation if they feel engaged. Ask about open positions, and ask what the representative likes best about working for the company. You can also ask for tips for getting hired with the company, or discuss some of the recent positive news about the company. Don’t ask about salary at a career fair. You want to look and act the part to make a good impression at the career event. Some events have dress codes, so you should find out if there is something specific to wear. Even if there isn’t a dress code, take care with your appearance. You should appear well-groomed. At the very least, dress business casual. While you may not need to be in a full suit, slacks and a button up shirt and tie can go a long way toward projecting a professional image. Speak and act professionally as well, avoiding vulgarity in words and gestures. Offer a firm handshake when you meet the recruiter, and make appropriate eye contact. By preparing ahead of time, and showing that you can be a valuable asset, you can increase the chances that your career event will turn into a job offer. What have you learned from a career fair? 1. Show your professional attitude. 2. Demonstrate a sense of humor and personability (very important that you’ll fit in to the company team). 3. Show your knowledge of the field. 4. Mention some of your experiences and show how you really did learn, grow, benefit from them. Key to this is not to go to the career fair with a sense of desperation, but with the same professional attitude as if this was already part of your job.